Beautiful print. It works great in our master bedroom - lots of compliments. Pictures come numbered and with hanging hardware already attached, which made hanging super easy. The 'Painted Petals XI' canvas art depicts an inked floral abstract defined by bold lines; a red bloom delicately complementing the design. 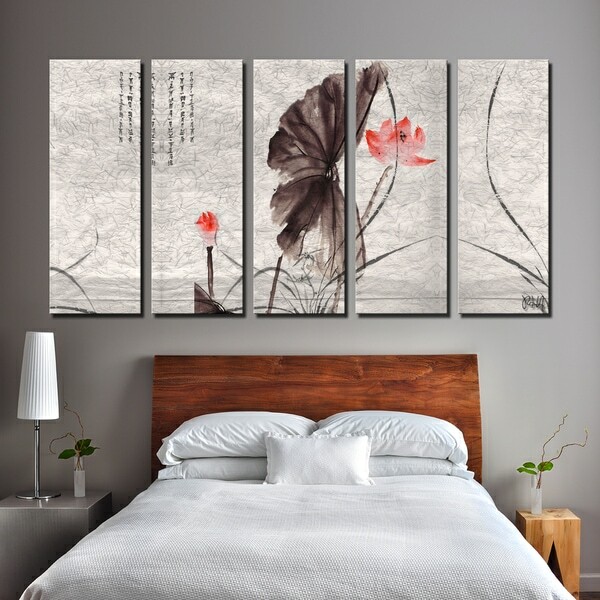 This canvas features a modern floral & still life style for a look that will be cohesive with your home decor. Ready2HangArt is a USA based vertical decorative art firm seeking to enhance people's surroundings with innovative designs, extraordinary quality, and unparalleled value. R2H makes #decorating simplified.. Title: Painted Petals XI Artist/Brand: Ready2HangArtPanel Dimensions: 30 inches high x 12 inches wide x 5 panels Overall Dimensions: 30 inches high x 60 inches wide x. 75 inches deep, Model No. PP11This elegant piece of wall decor will reinvigorate your house. Made in the USA from US and imported parts. This is a wonderful addition to our current bedroom decor. We get so many positive comments from friends and family. A masterpiece. Looks great and the color coordinates itself against our wall and got many compliments. It was not hard to put together and aligned up with each other. Love buying things on overstock. "Please clarify if the writing on the painting is Chinese. If so, what does it say or what’s the meaning. Thank you."